Spontaneously was discussed during the importance of development technics to reuse the water, a important sustainability topic. We talked about how the Artificial Intelligence would be used to monitor the body condition during an extraterrestrial travel: controlling some health levels of the space travellers. We were sleep after midnight, reflecting about many interesting, not only space, but human topics, such as consciousness: fundamental subject for the sustainability of space missions. I consider that in Space Mission and in Mars missions would be necessary some time to be flexible to think creatively. So, creativity and innovation is the key to We arrive in new worlds. Our experience in MDRS is a good place to think out of the box, about this advanced topics. Everybody wake up later. No stress! J Today We not had Extravehicular Activities (EVAs). 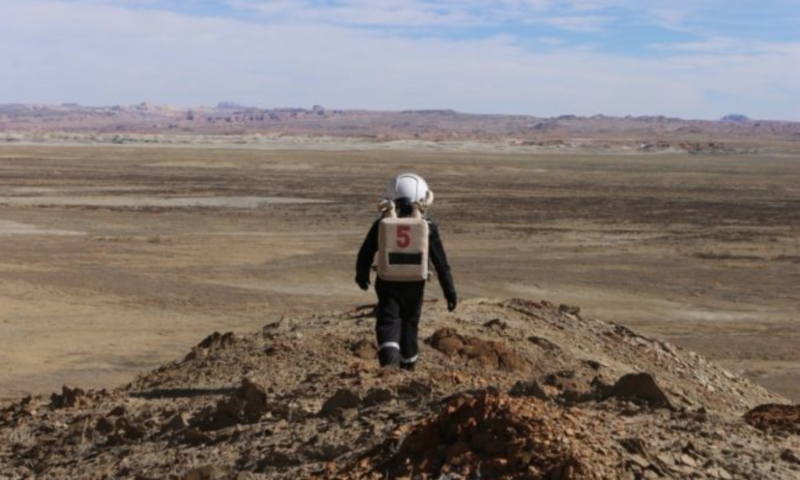 So, some of us explored some possibilities od the MDRS facilities and develop new tasks related to their research. 8h42m – 9h17m – I walked and ran during 35 minutes in the internal corridor of the MDRS, a distance equivalent to 3,5km or more than 2 miles. I consider do more of this. Before the mission was walking and running between 1 and 2,5 hours. I consider that physical activities it is also important to help us to think more creatively. I am motivated to encourage my crewmates also do some exercise during this time. One of the topics of my research is to evaluate how to deal with distance work activities. During the first days I had a lot of duties. So, today, during the morning, I presented a time to contact my partners in Brazil and also paid some bills using the internet banking services. In Mars this also will an important issue, because a person in mars continues to have some obligations in the planet Earth. Later our router was turned off. In Mars will be also times without communication with Earth. So, this is also part of our simulation. Also during the morning, I applied my survey related with sustainability with our crew. In the end of the mission I will apply a new survey and compare the result the perception of some sustainability issues perception that can be changed during the 2 weeks mission. In the afternoon, Atila started to do his agriculture experiment, comparing the use of regolith and the regular soil. The soils will be used to grow seeds and than He will compare the results generated by the two different soils. I had prepare some meals for the crew. I consider that a very important issue of the life in a habitat Mars related is the wellbeing. The first missions to Mars will be so unique and expensive that all the team needs to arrive will health in Mars. In the planet, the daily life is also important. I am, as a commander, consider be my responsibility to promote a better experience for all the crew. Each one presents their own psychological, social and physical space, and this needs to be respected and identify the best contribution of each. We are a great team! 13h40m – I started to prepare the lunch. 14h30m – Our lunch was: spaghetti with tuna and cheese, tomato soup, peas and broccoli. After the lunch We discussed some topics. Part of the crew still worried about the internet: if We will consume all the data available, etc. Part of the day the modem will be kept turn off. 16h35m – I walked more 25 minutes, completing 1 hour today. According to Apple Watch I walked 7,8 km or almost 5 miles achieving health goals for today! J I will try to keep those exercises. It perceivable how cold is outside today. MarsLab – Laboratory of Technologies Applied to Mars and Semiarid (www.MarsLaboratory.Blogspot.com), Mars Research Group – Mars and Arid Regions Settlements Sustainability and the Museu Espaço Marte (www.espacoMarte.Blogspot.com). I’m also committed to create the Mars Society Brazil chapter. 18h15m –Tonight I review all the MDRS Forms Instruction.